This provocative work analyzes Mae West's long life and productive career in three major phases: the early theater years, her meteoric film career in the thirties, and her subsequent life as a popular culture legend. It examines her theatrical approach to life and her unique talent for translating a low comic variety style into a subtle satire of melodramatic conventions. West's attempts to control her comic creation led her into many public battles over her claims to authorship of her plays and filmscripts. The book's bibliography explores her talents as a writer, summarizing the plays and books she wrote and investigating the validity of those claims. A thorough study of West's background and attitudes, this volume combines the approaches of both biographical and critical/artistic analysis and broadens our understanding of how Mae West fits into American popular culture. The book examines West's philosophy of success and how it was reflected in her personal and professional life, and places her in a historical and cultural perspective without forcing her personality into predetermined categories. 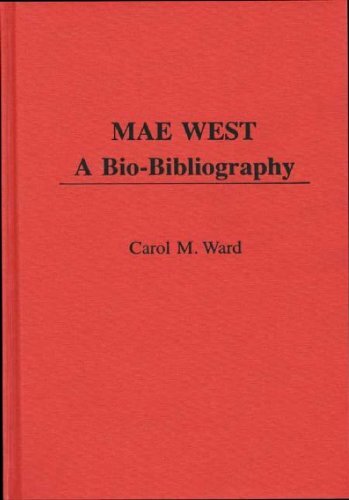 This bio-bibliography provides a fresh view of the legendary Mae West, and a new insight into the complexity of her artistry and social vision. It will be a valuable addition to all public libraries, and a useful resource in the study of American popular culture and film history.